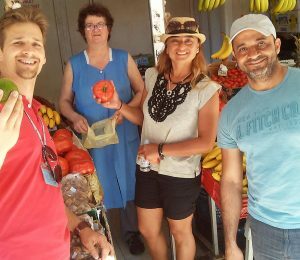 When traveling, one of the things we remember the most is- the taste of local food we had opportunity to taste. We will ‘warn’ you about top five Dalmatian dishes that you simply must not miss! 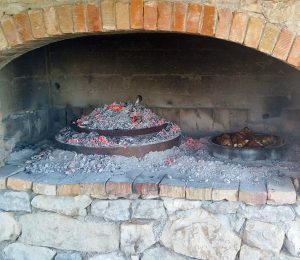 We will start with dishes under the ‘bell’ which fall into the very top of the gastronomic offer of Dalmatian cuisine, maybe we are a little subjective because we are a huge fans of dishes prepared under the open fire ashes. Taste of tradition and all the secrets of the dishes beneath the ash are hidden in magnificent ‘peka’. Not only that you will taste it with us, we will learn you how to make it! ‘Komin’ has always been a central place in the house, gathering and warming up family members and friends, hanging out together and waiting for the local specialties with the wine jug. The preparation masters claim that the best ‘bell’ is made of iron, and the size varies for up to ten people. The best flame material is a thin grab because it keeps the temperature for a long time. The grill plate should be fired about an hour and a half before laying the peculiar and overturned with a bit of fire, and it’s good to have some hot whirlwinds for ‘reserve’ if you need to add it. The secret of good ‘peka’ is first and foremost- patience, because it is the juice that is produced by the slow burning that makes a meal so unique and delishes. Therefore, it is necessary to separate for it two hours, and sometimes even more so it can catch that a characteristic taste and softness. Lamb, weal and pig are just some of the kinds of meat whose are perfect for preparation under the ‘peka’. The meat that is not soft enough needs to be marinated in oil and spices the night before. Set the fire an hour and a half before the preparation, then arrange meat and vegetables in a shallow bowl with tomatoes, peppers, onions and garlic. Put in your favorite spices, such as rosemary, oregano, laurel leaf, and thyme. As a spice all the herbs of Mediterranean cuisine can be served, but beware of the amount of flavor that would not overshadow the taste and smell of meat. Then grate the potatoes that you have previously cut into larger pieces and arrange with the meat and vegetables. Clean the frying substrate with a spatula and then place the bowl covered with a bun and cover it with warmed charcoal. Discard the bowl on the baking sheet and add white wine and stir. Let it be baked until the juice is reduced. After that- all you can do is to enjoy in magnificence of this meal! Pasticada is a dish that delivers the tradition of Dalmatia, together with its deep connection with the Mediterranean, right to you. There is no such Dalmatian restaurant that will not present their unique recipe for it. Pasticada, made of beef, is always served with homemade gnocchi. Sometimes, our ancestors used to compete whose Pasticada is “real”, but the truth is that there is no such a thing as real Pasticada- every family and chef is preparing it in its own way, according to only their recipe. Pasticada is Pasticada and each one is the best because Pasticada is the tradition of Dalmatia itself. The key thing in Pasticada is to balance three flavors: sweet, sour and bitter. Pasticada has to balance all these three flavors: if your sauce is to sweet, you need to add some more wine and laurel. If it’s to sour, you need to add a caramelized sugar and if it’s to bitter, add a little prosecco. When it comes to Pasticada, it is important that none of the three main flavors should overcome, so when you take a spoonful of sauces, it must also be sweet and sour and bitter. Trust us- you will return to Croatia just to taste Pasticada and gnocchi again! When we talk about sea food- octopus is something that you must not skip when in Dalmatia. Cooked, baked, roasted or it can even be dried, which is still just a gastronomic tradition of some of our islands, octopus certainly belongs to specialties that are not tasted often but always with the same pleasure. 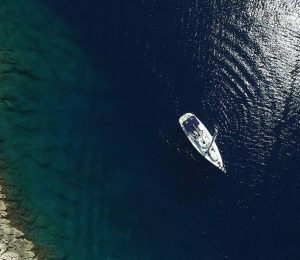 This peculiar sea inhabitant, known for adapting the color of the environment, is also an excellent source of minerals, for example, selenium and magnesium, and vitamin B complexes. The octopus can be obtained fresh, and it is best to clean and prepare it the same day or frozen. It can be prepared in a variety of ways. The octopus salad can be the main dish or appetizer, and the octopus under the ‘peka’with roasted potatoes is also a specialty that cannot be resisted! But, in Dalmatia, before we start to eat anything, the first thing we eat is cheese and- prosciutto. Prosciutto is often mistaken for ham but it is very specific- an uncooked, dry cured ham which has to be sliced thinly which allows all its flavors to stand out so the perfect taste simply melts in your mouth. The process of making prosciutto is very sophisticated, the hind leg of a pig has to be cleaned, salted and left to dry in a cool environment for two months. After that, since the salt destroyed all bacteria and blood leftovers, it takes 9 months up to two years to finish the complete process. Most often we simply slice it thin and eat with bread and cheese but you can wrap it with anything because prosciutto simply makes everything perfect. As well as ‘peka’, prosciutto taste is also unmeasurable with anything you have ever tried before. Soparnik, unique dish of the area, used to be the food of the poor people and today it is a famous and expensive delicacy. Poljicki soparnik is a Croatian food product, which gained the title of protected geographical origin at the European Union level. This specialty of Dalmatian Poljica, is old traditionally dish that dates from the time before the Turks. This area of Poljica has always been known for valuable and well-educated people, and this is particularly pointed out by the Poljicki statut (the Constitution), whose parts are incorporated in the basics of European laws and recommendations. 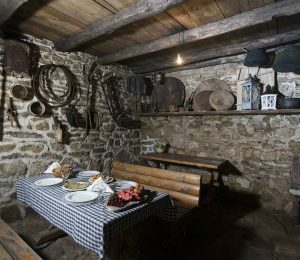 Soparnik is still being preparing in a traditional way- originally prepared on round wooden boards and baked on ‘komin’, the open fire covered with ashes. It is easiest to imagine it as a large, thin pizza but made from soft wheat flour, mangel, onion, olive and sunflower oil, garlic, salt and water. Round shape, diameter from 90 to 110 centimeters. The surface is covered with olive oil and finely chopped garlic. While writing about these amazing specialties we started to feel hungry with smell and taste of this amazing goodies.. can’t wait to be on these tours again! !